While I have written an extensive article on every release so far relating to James Stinson and Gerald Donald there are still four individual tracks relating to Drexciya which I have not gone into in detail which are well worth examining while we await new material and news. 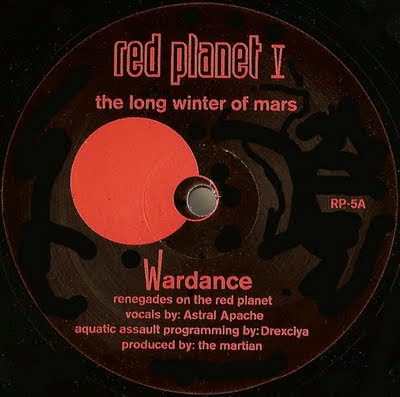 The nature of these oddities are, in order of release; a collaboration with The Martian, ‘Wardance' on Red Planet in 1994, a remix of UR’s ‘Electronic Warfare’ in 1996 and the track, 'Davey Jones Locker', included on the 'True People: Detroit Techno' compilation on React in 1996 and the track ‘Aquatacizem‘, included on the Interstellar Fugitives compilation in 1998. For any artist or group after a 10 year lifespan to have so few tracks in their catalogue not exclusive to one of their own releases is unusual, especially in electronic music. But James Stinson at least is on record as not liking the idea of his own material being remixed, "It’s a piece of art, like the Mona Lisa, never meant to be remixed.” So I guess he would have largely felt the same way about doing it to others. Also, while they did appear on many compilations it was usually with previously released material. Stinson did not tend to collaborate with anyone outside of Donald either and if he did this material has never surfaced. I say this as I could imagine it as being very likely that there would have been times he was over at the UR studio for example when his talents might well have been used but not directly acknowledged as this was the collective way with UR. I guess this goes for Donald as well but with him I see it as less likely he would be into hanging out at other people’s sessions but you never know. He did begin officially collaborating with others outside of Stinson in the mid nineties onwards with Brendan M. Gillen as Flexitone and more than likely was at the dawn of Ectomorph as well and this subject I will probably cover in some detail in the future. Not to mention his Dopplereffekt collaborators, Kim Karli and William Scott, from 1994 on. There was also one other collaboration, this time jointly, as X-Ternal Pulse at the beginnings of Ultradyne, I have written a bit about this already and here is link to that article. In case some of you are wondering, The Elecktroids collaboration has already been covered by me. I was going to do these three releases in one article until I realised I had too much to say about each one and with this lengthy intro piece as well I've decided to split them up. Have also squeezed in new Dopplereffekt info at end of article. So in order of release here we go. Next in this series will be Drexciya's Electric Eel Mix of UR's Electronic Warfare. There are two full length Dopplereffekt shows online to watch. and the more recent show in Berlin, Germany 28/11/09. Also a new live track with vocals has emerged from Dopplereffekt, perhaps called 'Extra Dimensions'. It sounds like an outtake from Calabi Yau Spaces to me but well worth a listen.